This has been an extremely busy week for me, as I was baking 300 cupcakes for a luncheon my coworker coordinates. Have you ever started a project and then wondered to yourself, hmm....am I in over my head right now? That is definitely how I felt at some points this week. It was the biggest baking project I've worked on by myself. Kyle is usually my second in command when I bake for large groups of people. He washes the dishes and runs to the store for forgotten items and does whatever I ask him to - aka he is a really supportive boyfriend. He was sick this week so he was supporting me from the couch instead of backing me up in the kitchen this time. Every time I take on another big baking project like this, I learn a little bit more. I learn about planning ahead and strategizing and juggling and how many cupcakes can fit in my freezer (the answer is about 200). I learn a little more each time, but I also come up with new questions to puzzle over.. which just inspires me to want to learn more. It's an endless cycle, really. I'm going to write about a few of the lessons I learned, but I'd like to say that I would love to get input from anyone reading this. 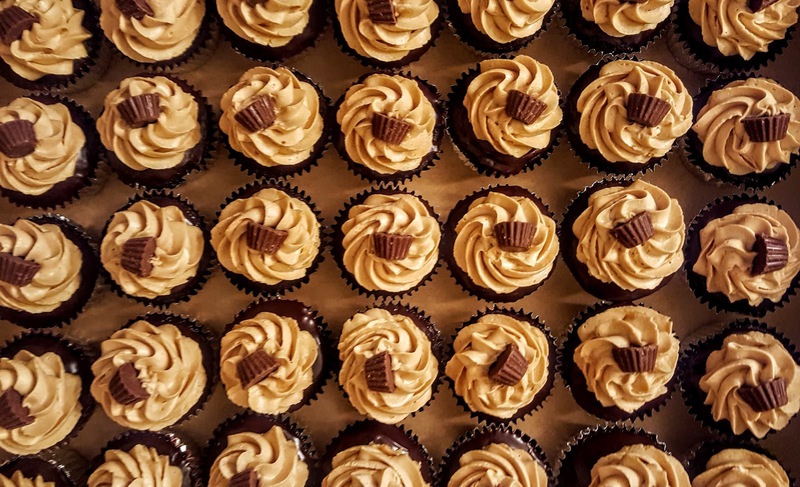 Share your own stories about cupcakes or other baking lessons learned in the comments to spread the knowledge around. 1. Use good quality cupcake wrappers. Personally, I prefer the foil wrappers. 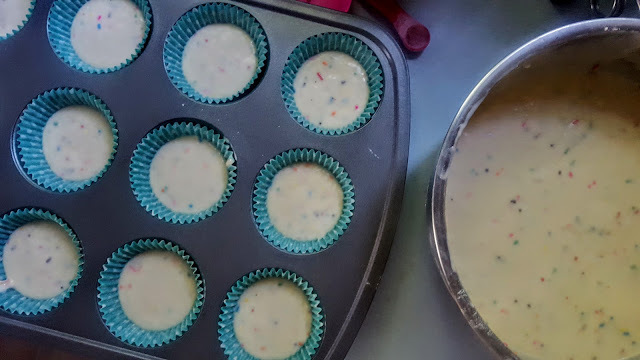 They look good with pretty much any color combination, they keep their shape well while baking, and they peel away easier when you are eating the cupcake. They may be slightly more expensive than the classic white, yellow and light pink paper wrappers sold at virtually any grocery store, but they are worth their weight in gold. 2. Use a recipe with less fat. The more oil or butter in your recipe, the more greasy the batter will be. This will make it slippery and less likely to 'grab' the wrapper and stick to it- thus making it more likely to pull away once they are out of the oven. Additionally, when creaming or mixing the fat and the sugar, do it for a longer period of time with the butter as close to room temperature as possible. When all of your ingredients start at the same temperature, they will mix together more thoroughly to create one cohesive mixture. This causes the grease to be better absorbed by the sugar, making the batter less greasy. 3. Make sure to put enough batter in the wrappers. I hate a cupcakes that spills over the sides of the wrapper as much as the next person, but an underfilled cupcake wrapper is another culprit of peeling. A good rule of thumb is to fill the wrappers approximately two-thirds full. The more cupcakes you make, the more comfortable you will be with how full to fill the wrappers. Additionally, I've found that different recipes behave very differently in terms of how much they rise in the oven. You kind of just need to know your recipes, your pans, and your oven. One common recommendation is to use an ice cream scoop so that you put an equal amount of batter in each wrapper. That will also promote even baking. I haven't actually tried this because I don't own an ice cream scoop (yikes! ), but it's on my list of things to try! 4. Bake the cupcakes long enough. I have a serious fear of overbaking. Dry cakes are my nightmare. However, underbaked cupcakes will ultimately cause shrinkage once they come out of the oven, which again leads to peeling. It's a fine line to walk, and my advice again is just to know your recipe and your oven. You can test the cupcakes to see if they are fully baked by lightly pressing the top (this also goes for normal cakes). The cupcake (or cake) shouldn't stick to your finger and it should spring back right away when you press on the top. 5. Take the cupcakes out of the pan RIGHT AWAY. This one is interesting to me, because I also see people advising to completely cool the cupcakes in the pan. However, if you leave them in-pan to cool, they will start to sweat while cooling and absorb the extra moisture, which leads to peeling. I try to take them out within two minutes of them coming out of the oven - basically as soon as I can without burning my fingers off. This was the first time I have ever made cupcakes ahead of time and froze them. When I've baked for large groups previously, I've had more time during the days prior to the event and have been able to do all the baking right before. That was not an option for me this week, so I spent a lot of time reading up on freezing cupcakes. Basically, there are three schools of thoughts when it comes to this: never freezing cupcakes, freezing plain cupcakes, or freezing completely filled and frosted cupcakes. I wasn't quite bold enough to try the frosting/filling/freezing option so I stuck with freezing the cupcakes plain. I was most worried about the cupcakes drying out in the freezer and/or the wrappers pulling away from cupcakes during the thawing process. Since I was only freezing the cupcakes for about five days, I didn't bother to individually wrap each cupcake in plastic wrap before putting them in a ziploc bag, which was recommended by some sites I consulted. If I were freezing them for a longer period of time, I would probably do this in order to keep them from getting freezer burn or picking up weird smells in the freezer. When I put them in the ziploc bags, I tried to get as much air out of the bag as possible before closing it and then just stacked the bags on top of each other in the freezer. As soon as I pulled the bags from the freezer, I took each cupcakes out of the bag and set them out on the counter to thaw. 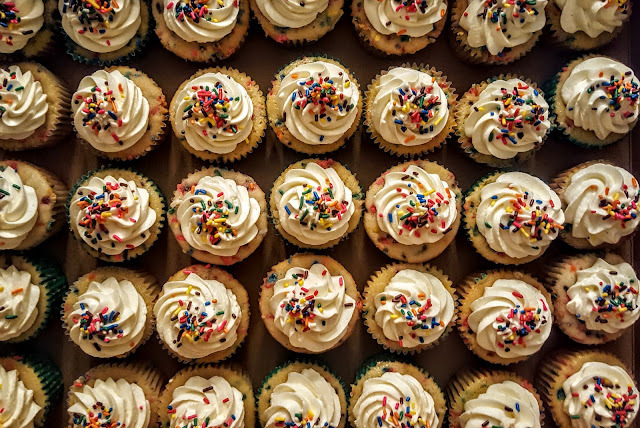 Some people recommend leaving the cupcakes thawing in a sealed or airtight container, but this would cause moisture to be trapped in the bag and on the cupcakes, again leading to the wrappers peeling away. 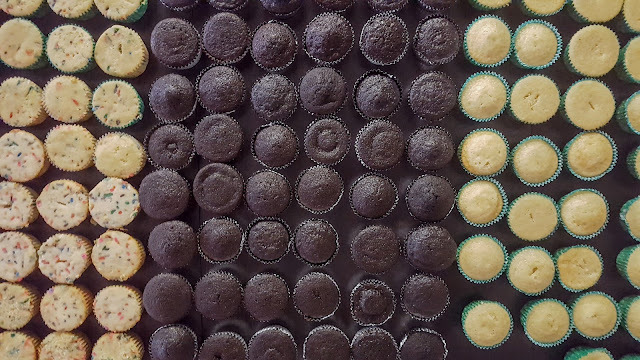 I froze about 250 cupcakes and was mostly pleased with the thawed cupcakes. I did have a few cupcakes (approximately nine) where the wrapper peeled away. I wasn't really sure if it was due to the thawing process or something during the baking process. 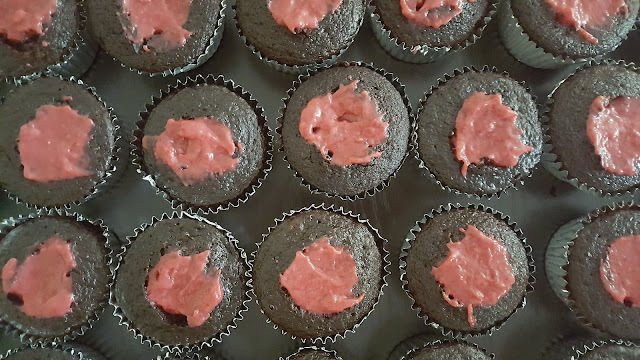 One interesting solution I read was to use a bit of frosting to 'glue' the wrapper back to the side of the cupcake and then carry on with filling and frosting. I don't think this would work if the wrapper was completely peeling off, but it could be a lifesaver if just a small part was peeling away. I didn't try it because I had made some extra cupcakes which I just used instead, but it's certainly an intriguing idea. 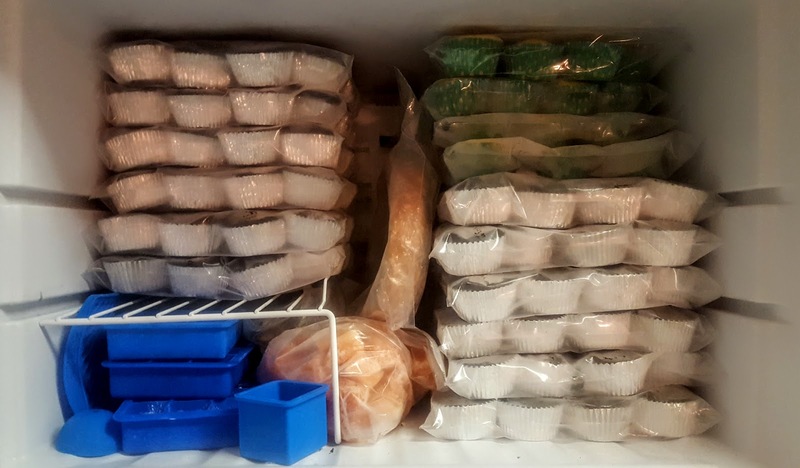 This is what my freezer looks like with 200 cupcakes in it. I made two different kinds of cupcakes, two different fillings, and three different frosting for a total of four different cupcake combinations. This definitely called for making the components ahead. 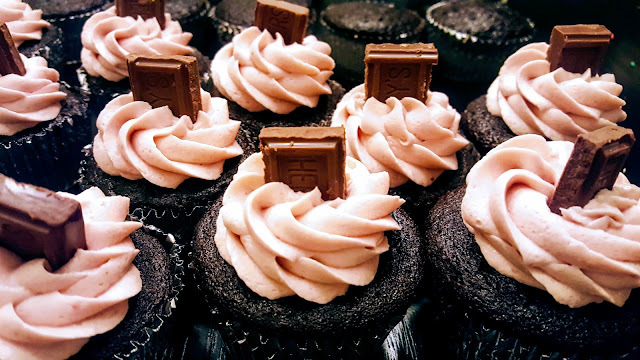 As a general rule, frostings can last in the fridge for about a week and in the freezer for at least a month if not two. Fillings, depending on what is in them, can also be refrigerated for about a week. I've often made frosting ahead of time, and in my opinion, the most annoying part is bringing it back to room temperature. If you don't have the chance to pull it out a few hours ahead of time, you actually have to put it over a double boiler to warm it and then whip it for a few minutes. This is such an annoying additional step in my opinion. This time around, I learned an extremely helpful make-ahead tip while perusing various baking websites. After making a batch of frosting, you take a piece of saran wrap and plop some frosting down the middle of the saran wrap. You then roll up the frosting in the saran wrap and twist the sides, so that it resembles a very large tootsie roll. Keep doing this until you have several logs of frosting. Once you're done, you can throw your frosting tootsie rolls in a ziploc bag and put them in the fridge until you are ready to use them. The day you want to frost your cupcakes, pull the bag out the fridge maybe 20 minutes ahead of time. Take your decorating bag with the decorating tip of your choice and just slide the roll of frosting, saran wrap and all, into the bag and BOOM - you are ready to go! This technique keeps your decorating bag nice and clean which makes it much easier to switch out tips or different colors/flavors of frosting. It's also extremely helpful when trying to pipe striped frosting. I tried this for the first time during this baking project and it was probably one of my most successful and least frustrating frosting experiences ever. If you are more of a visual person, there is an awesome photo tutorial of how to do this on of my favorite cake forum websites, Cake Central. The final lesson that I wish to mention is simultaneously the most important and most difficult lesson to learn, not only when baking but in all things you do - accepting failure. Having a recipe come out differently than I expected or hoped is always really hard for me, and yet, it's bound to happen and to happen frequently. I love learning about baking science because it gives you the ability to control a recipe, but there's no way to control for everything going perfectly every time. You can put an oven thermometer in your oven, but you can't make the heating element work consistently every time. You can make a recipe exactly the same as you did the last time, but sometimes it might just bake up differently, and you won't know why. As a semi-perfectionist, I get so frustrated and angry every time I mess up a recipe. 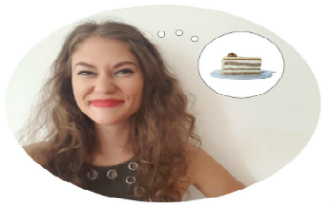 There have been so many experiences and recipes that left me in tears, or worse, silently simmering in anger and frustration, so mad at myself and the situation that all I can do is stand there and glare at the ruined cake in front of me. Kyle knows this well because he is often the one who is standing next to me, patting my back and telling me it will be okay, we will figure it out. It's very difficult for me to look through the frustration to find a solution- I default to blinking back tears of anger and wanting to throw something. But I'm working on it. Every time I bake something new or complicated I have to accept that the results may not come out how I wish, but ultimately, I will find a solution and finish the job. By anticipating and expecting something to go wrong, I can mentally prepare. It's like why every financial advisor will tell you to have an easily accessible emergency fund. It's not if you'll need to use it, it's when. Planning ahead for failure is my emotional emergency fund. That way, when something goes wrong, I can check it off the list (a big mess-up that makes you frustrated, check!) and move on to the next item on the list - finding the solution. I'm not trying to be sappy or deep here, but to address something that is part of every baking experience. I don't want my blog to be a highlight reel of my successes. I want it to be an honest commentary on baking where you can learn some practical knowledge along the way. This baking project had the usual ups and downs, and I may or may not have laid down on the couch and watched five hours straight of New Girl the evening after finishing and delivering the cupcakes. But, the moral of the story is that I got it done, and that I learned something along the way. Hopefully you did as well- thanks for reading. Beautiful pictures, great tips from real life experiences and honest emotions ... A winner of a blog! Two dozen cupcakes for an event may be my limit.